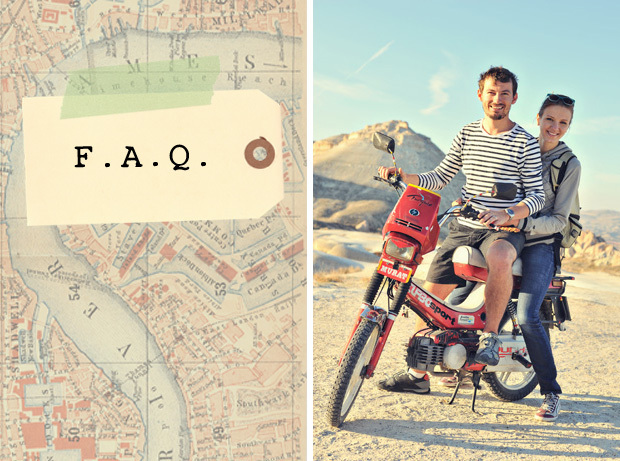 We've been getting quite a bit of emails with many repeating questions so we decided to do a little FAQ. If you still have a question or comment, please feel free to email. We love getting emails and try to reply to everyone as fast as we can but for those that don't have the time to write (or are shy), hopefully this will help. We are using our very awesome Nikon D700 and a little compact camera that we just picked up for this trip, the Canon SD 4000. We decided to only bring one SLR camera and share it since it is very bulky and heavy. This is a great camera and we highly recommend it to anyone who is looking into getting a higher end SLR. If you have any more questions about SLR cameras and getting into photography, please email us and we'll share a lot more info with you about different cameras, what to look for, where to buy, etc. We bought the Canon SD 4000 mostly for the HD video. We thought it would be nice to be able to do some video every once in awhile and also to have something smaller that would fit in a pocket when we didn't want to lug around the SLR camera. We paid $320 for it and it has been great thus far. At first we were looking for a compact camera with manual controls but decided on this after reading some very positive reviews of it online (it does have aperture and shutter priority though). Another very cool feature with this camera is the fact that it has a tilt-shift effect built into it. It's not anything like a real tilt-shift lens but it does the job and for a lot less than an actual tilt-shift lens. It's also not as big and bulky. To see our travel videos all in one place, you can visit our YouTube channel. What kind of lenses are you using? We obviously don't have much space in our luggage to bring many lenses so we stuck with the basics-- 24mm, 35mm, 50mm, and the 85mm. They are all prime lenses, so they are smaller then the bigger, bulkier zoom lenses. It is a bit of a hassle switching the lens especially if you have to do it often but it's worth it for the image quality and compact size of the lenses. Also, when photographing people on the streets, a prime lens is a lot less intimidating than a huge zoom lens in your face. We use the 50mm f/1.4 the most. I would say a good 60% of the time that is the lens on the camera. What kind of post processing do you do to the images? We use a few Photoshop actions from Totally Rad Actions. We highly recommend checking them out. You can actually see what each action does to an image on their website. Other than that we don't do much else, maybe a little cropping here and there. Which TRA actions do you use? Totally Rad Actions has so many amazingly good looking actions (and they keep making new ones!). We keep it simple and use a combo of "Boutwell Magic Glasses" and "Lux" on the majority of our photos. The first for some pop and the second for a creamy look. Our favorite black and white action is "Detroit" with some tweaks. We also use a few actions for occasional color or light correction if your photo is a little overexposed or too yellow or something funky like that--"Cool as a Cucumber", "Warm it up Chris", "Lights Out/On", & "Ying Yang". We usually never use an action at 100% opacity because its overpowering and looks too fake. It's like a girl wearing too much make-up. Lower the opacity for a subtle kick to your photos. How are you able to afford to travel for so long? Get married! We both knew we wanted to travel after we got married and the longer the better. We were originally thinking to travel for a year but realized that we would need a lot more finances than we could come up with. Because of this we started saving early on for our travels. But the biggest financial boost came from our wedding guests. We decided that we didn't want any wedding gifts since we have everything we need and if there is anything additional we want, we would rather pick it out and buy it ourselves (I'm talking about items such as cookware and household things). So we created a travel registry where our guests could see what we wanted to do around the world and contribute financial gifts towards our travels. To see what I'm talking about go to - www.yuriymanchik.com/proofing and click on the top right tab titled "Travel Registry". This is what our guests saw. For example, there would be something titled "Romantic Dinner in Paris" with a personalized description and cost, say $50. This way people could "buy" us experiences for our travels that we would want to do anyways and they could feel good about giving us an actual gift instead of just a check for who knows what. We decided we wanted to travel for 6 months but we know that if we run out of money, we're getting on a plane to come home early. We're prepared for it and have realistic expectations. This helps us not to splurge because we would rather travel for a longer time and see new things than stay in a fancy expensive hotel for a couple days. We haven't done any shopping and skip on most tourist activities. We've been keeping an expense report of all our spendings in every city. At this point it's pretty massive. When we realize we've spent way too much money on restaurants in the past week, we cut back for the next few days and eat at more quick, casual places to help even it out. Often you can get a discount with lodging by committing to a prolonged stay rather than just a couple of days. We travel by buses or ferries (even if they take forever and are horribly uncomfortable to sleep in), avoiding planes and taxis. It's important for you to know we're not living in luxury. As long as we're abroad, we're happy. How are you able to leave the things that tie us down for so long? A week of annual vacation time from work (the American norm) is brutal. We have to to admit that we're a lot luckier than most people in this area. Since we are wedding photographers, we can take off as much time from work as we choose. Additionally, the majority of our work happens in the summertime. We strategically got married in September, at the end of a busy wedding season. This way we could take off for the winter, a time when we have far less wedding clients. Julia is a graphic design student, so she's also taking a break from school. Mortgages tend to tie people down as well. Prior to our wedding, Julia lived in an apartment with a bunch of girls, so all she had to do was not sign the lease for another year. Not very difficult. And Yuriy's condo is on the market for sale at the moment. If you own a place and want to travel for a longer period of time, consider putting it up for rent while you are away. If you're single, it's even easier for you to get up and travel. No excuses! It just takes a little courage. First you have to decide that you'd rather have travel memories to last a lifetime rather than a new car or regular shopping weekends. Did you plan the whole trip out or are you doing everything on the fly? This whole trip is completely on the fly. The only thing we bought before our wedding was the plane ticket to Paris and reserved a Paris apartment for a week. Since then, we've been doing everything as we go and it's been working out very well for us. A big advantage we have is that it is off-season in Europe so it's not difficult to find an apartment or book a bus/ferry/train last minute. Often times as soon as we step foot into a city off a boat or bus, someone will approach us with a really good deal for a place to stay. Many hotels are empty at this time of year and they're desperate for guests. We're able to get some great deals this way and we have been bargaining on everything. I know that some people can not travel like this and we wouldn't recommend this option for everyone. If this type of traveling suits you and you won't be stressing out, then it's the way to go. It's awesome to be able to decide which country we want to visit next just by looking at a map and seeing what's near or have a fellow traveler recommend a city or country and be able to just go there whenever we please. We're not tied down in any way. We can stay as long as we like or as little as we like in any city or place we want.... complete freedom. The downside is, sometimes the ferry/train/bus might be full to where you want to go (which happened to us in Rhodes) or all the cheaper hotels are booked, or that last minute flight turns out to be very expensive, and so on. But there are always ways around little problems like this. When the ferry that we wanted from Rhodes to Turkey was full and the next one wouldn't leave until 5 days later, we changed our plan and took a different ferry to nearby Kos. After overnighting there, we took a second ferry to Turkey. It worked out for the best because we got to see another Greek island and it was the same price. Would you guys be able to do a photoshoot of my husband and I when you come to Thailand? Of course, we would love to do a photoshoot in a foreign country. There is nothing more inspiring than shooting in an unfamiliar place. If you're interested in a photoshoot, send us an email, even if you're unsure of our travel plans. If we're going to be in your area, we can definitely set something up. Remember, our travel plans are not concrete and we're always looking for new places along the way, so we might come visit your city just because you invited us! Also, if you're a fellow photographer, we would love to meet up and hang out for a bit. We enjoy meeting other photographers and making new friends. Okay, even if you're not a photographer but want to meet up just to chat and connect, we would love to do it. We've been isolated from friends and family long enough. Are you still booking weddings for 2011? Yes we are. We still have some great weekends available, so if you're getting married or know someone who is, please email us and we can give you more details on our packages and rates. Our wedding photography website and blog may help you get to know us a little better. If you prefer to meet in person, our associate photographer Lily is still in Seattle and available to discuss your wedding day and let you see some sample albums. We plan on returning home to Seattle in March, so if your wedding is anytime after that, we would love to photograph it. i absolutely love this faq post! as a photog enthusiast - i appreciate all the camera talk :) but more so i appreciate that you share how you are able to travel like you are. it's true about skipping the luxury hotels so you can afford a few more days/experiences. for me, travel is all about the experiences - not just sleeping in beautiful hotels and eating at 5 star restaurants (though that is nice!). i love that you are balancing it out. i'm moving to india in the new year (never been) and am excited to travel around the country and experience the culture. if you guys decide to add india to your itinerary my couch is yours! seriously :) i'd love to meet up, do a little photography walk around the city and just hang out. i'm hoping your funds last the entire 6 months because i love what you guys are doing - and your travel registry was genius! haven't seen anything quite like that before. Thanks you so much!! What an excellent idea the travel registry is! The Photoshop actions are changing my life and please let me know if you ever come to Montreal! It seems like there's more and more travel couples popping up!! Thanks for the awesome FAQ. It kind of reminds me of the blog, sending postcards, they went traveling after they got married too! Awesome answers!!! I'm lusting over that Nikon! Kay, thank you for saving a couch for us! We are honored. India is not in the plans for this trip, but that may always change. Jenny, I just checked out "Sending Postcards". Wow, we do have a lot in common, don't we? I bookmarked. Thanks for sharing. Hi guys, chanced upon your blog and absolutely love the stunning photos! I'm based in Singapore in South East Asia, so if you have 3 to 4 days, are into good food, a spot of shopping and want to be immersed in a multi-racial society, do feel free to drop by! And I'll be keen to volunteer as tour guide (though I'm not a photographer!). Cheers and look forward to your adventures ahead! i personally enjoy the two-wheeled object you're driving! Amy, you must come up to Seattle when you are in the States. No place like it. We'd love to meet up. Joy, we have been thinking about Singapore all along, but I think your invite just solidified our plans! thanks so much for sharing this! so interesting... i had never really thought of a travel registry before. did it work well with your guests? i would just be afraid some of my family wouldn't be able to figure out how it works...haha! also, did you get my emails with istanbul advice? enjoy the city!! very helpful F.A.Q Thank you so much. Have a great time Julia and Yuriy. Hope to hear from you soon. Love the pictures, the influences, the attitude. It's always a pleasure for me to explore your blog. I appreciate your sharing what equipment / processing you do... and describing the "how" of your travels. I love reading your blog and seeing your photos. We stayed 3 weeks in London one Christmas and rented a flat... one of the best experiences of our lives! Have a wonderful trip!! I love your pictures so much, they look so natural, but i'm a really big canon fan =/ which canon camera do you think would compare with your nikon D700? A wonderful . i wish i could be as lucky as you are. i wanted to share some info with you. Janis, you're right, some tech-challenged guests never even saw the travel registry. We had a little card in our wedding invite that said we would appreciate financial gifts toward our travels, so everyone understood even if they didn't use the online registry. Many guests just gave us a check with a card at the wedding and noted where/on what they wanted us to spend it. I've been reading your wonderful blog for awhile. Absolutely love all your pictures! Thats awesome. Thanks for the answers.